Résidence Les Hauts de Veysonnaz price per day from CHF 142 . Résidence Ski Paradise price per day from CHF 238 . Ski Heaven price per day from CHF 252 Located in Veysonnaz, 300 metres from the ski lifts, Ski Heaven offers a sauna, a hot tub and an apartment with a balcony and panoramic mountain views. The apartment provides a flat-screen TV, a DVD player, a seating area, a fully equipped kitchen with oven, a washing machine and a bathroom with bath tub. Residence Plein Ciel price per day from CHF 109 . 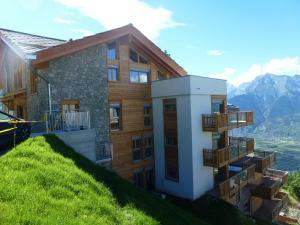 Apartment Les Bouillets Veysonnaz In the house: ski storage, washing machine, tumble dryer (for shared use, extra). Holiday Home Aramis Veysonnaz Interior4-room chalet 130 m2 on 2 levels, comfortable furnishings: living/dining room with panoramic window with swedish stove, cable-TV, stereo unit and DVD. Balcony, west facing position, large terrace, south facing position. Chalet Wanderoo price per day from CHF 198 This elegant chalet in Veysonnaz is 100 metres from the Veysonnaz Cable Car and the slopes of the Quatre Vallées Ski Area. Chalet Wanderoo features 5 bedrooms, 3 bathrooms, an open kitchen, and a living room with a fireplace, cable TV, and CD and DVD players. Veysonnaz Bus Stop is 200 metres away, providing connections to Sion..
Hôtel Magrappé price per day from € 86 Set in the centre of the ski resort Veysonnaz, Hotel Magrappé enjoys beautiful views over the Valais Alps. All bright rooms have wooden furniture and are decorated in Alpine style. The restaurant of the Magrappé serves Italian cuisine such as pizzas prepared in a wood-fired oven as well as Swiss specialities either indoors or on the sunny terrace..
Appartement Royal 041 price per day from CHF 179 Featuring a balcony with panoramic views over the Rhone Valley, the elegant Appartement Royal 041 is located right next to the cable car for the Veysonnaz Ski Resort. Appartement Royal 041 has a fully equipped kitchenette including a dishwasher, a living area with comfortable sofas, a flat-screen TV, a DVD player and a Hi-Fi set..
Chalet Adele Located directly on the ski slopes in Veysonnaz, 300 metres from Ski Lift Veysonnaz - Thyon, Chalet Adele offers a self-catering accommodation unit with views of the surrounding mountains, ski-to-door access and modern décor. The 3-floor chalet comes with 4 bedrooms, a living room with an open fireplace, cable TV and views of the Rhone Valley, and a modern open-plan kitchen with a dishwasher..
Chalet Krystyna Chalet Krystyna is a typical Swiss chalet in a central location of Veysonnaz at 800 metres from the next skiing slopes, offering a panoramic mountain view, a fireplace and free WiFi. The chalet with 5 bedrooms features a fully equipped kitchen with fondue set, 3 bathrooms, a living room with a fireplace and a TV with cable channels and DVD player. 16. Turn left to stay on Route de Nendaz. 17. Continue onto Route de Veysonnaz-Nendez. 18. Slight right onto route de Beuson. 19. Take the 1st right onto Route de Magrappé. 20. Take the 1st left to stay on Route de Magrappé. 21. Turn right onto Ch. de Pra. Ski resort Adelboden-Lenk, number of ski pistes: 176. 33 km from town of Veysonnaz. Ski resort Adelboden, very good nightlife, many restaurants and pubs. 36 km from town of Veysonnaz. Ski resort Aeschi, number of ski pistes: 8. 58 km from town of Veysonnaz.